Brock Stassi, a former 33rd-round pick, could land a spot on the Phillies bench with a strong showing in Clearwater this spring. CLEARWATER, Fla. –– In exactly six weeks, the Phillies will be in Cincinnati instead of Clearwater, and they’ll be preparing for the start of the regular season and not the Grapefruit League season. Although there’s still a lot to take care of in the next month and a half, the everyday lineup is basically etched in stone, barring injury. The starting rotation has five pitchers inked into spots, too, barring injury. There are even a handful of relievers who have strongholds on jobs. So, where’s the intrigue this spring? The most competition will arguably come from finding the five players that will man the Phillies bench on Opening Day. Of all the players in camp, only one projected reserve, veteran utility man Andres Blanco, is the owner of a major league contract. There are only two or three others even on the 40-man roster (Aaron Altherr, Andrew Knapp, and Jesmuel Valentin, and Valentin is more likely to open the season as the second baseman at Triple-A Lehigh Valley). The majority of the players on that roster are either proven starters (Maikel Franco, Freddy Galvis, etc.) or top prospects that still need minor league time (Nick Williams, Jorge Alfaro, etc.). This is all good news for a guy like Brock Stassi, who has quietly had two impressive back-to-back seasons in the upper levels of the Phillies minor league system for a late-round draft pick. The 27-year-old Stassi was the Phillies pick in the 33rd round in 2011, in a draft when they took the likes of Larry Greene, Roman Quinn, Adam Morgan, Cody Asche, and Ken Giles in the first two days. Stassi wasn’t even awake by the time the team came around to calling his name. “It was Day 3, and my dad was watching it online,” Stassi said with a laugh. To be fair, the draft got started early for a kid from Northern California on the third day. But he quickly rose from bed and got caught up with the news … although there was at least a little confusion initially. It was just about 10 years ago, in the fall of 2007, that Stassi began his collegiate career at University of Nevada-Reno as a left-handed pitcher. He didn’t hit regularly until his sophomore season and didn’t play in the field until he was a senior, just a few short months before the Phillies drafted him. And unless you count the 21 starts he’s had in the last half dozen seasons while climbing the Phillies minor league ladder, Stassi hasn’t played the outfield regularly since he was in high school. So, what then, exactly, makes him an ideal candidate for the Phillies bench? Again, he’s coming off impressive back-to-back seasons at Triple-A Lehigh Valley and Double-A Reading, slashing .285/.383/.455 in 250 games. 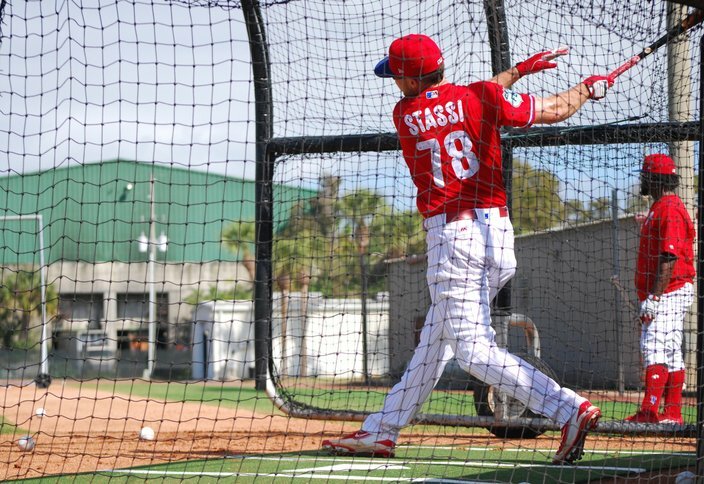 And as a left-handed hitting first baseman who will see time in the outfield this spring, too, Stassi could be a left-handed complement to right-handed hitting Tommy Joseph if he has a strong spring. “It’s very real,” Stassi said. Brock Stassi hit .267 with a .369 OBP, 12 home runs, and 26 doubles in 117 games at Triple-A Valley last season. If he makes the Phillies roster, he could see time at first base as a left-handed hitting reserve to Tommy Joseph. If you work the numbers game, Stassi doesn’t have an obvious spot at Triple-A with Rhys Hoskins coming up from Double-A Reading to play first base and the designated hitter and regular outfield spots likely going to the prospect-filled foursome that includes Roman Quinn, Dylan Cozens, Nick Williams, and Tyler Goeddel. If you’re going to be a reserve, you might as well do it at the highest level. Because of the aforementioned 40-man roster math, the Phillies front office will almost surely need to add two current non-roster players to the mix in order to complete their bench. Blanco, Altherr, and Knapp are the early favorites for the first three spots. Among the group competing for the last two: Stassi, fellow farm system product Cameron Perkins (a right-handed hitting outfielder), versatile veterans Chris Coghlan and Daniel Nava, and fellow non-roster players Pedro Florimon, Hector Gomez, and Taylor Featherston. Stassi made an impression on Phillies manager Pete Mackanin last spring. 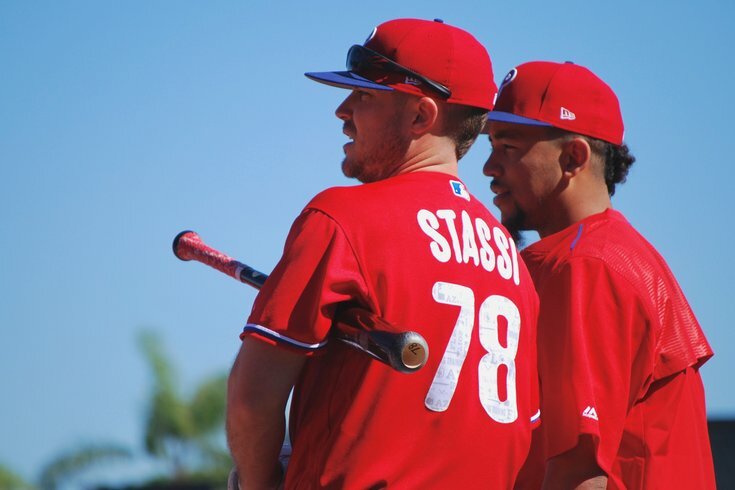 Stassi reported to camp with a bat more than ready for the Grapefruit League: he hit .297 with a .448 OBP and six home runs in 32 games for Ozzie Guillen’s Tiburones de La Guaira in the Venezuelan Winter League.